How does an artist make a living? What compromises does an artist make? Is the idea of the “sell out” obsolete? How have the technologies of the past 20 years made it possible to be an artist? What does it mean for a city to have a good creative culture. What do you do when offered the opportunity to script an opera? Artist, if these are questions that keep you up at night, read on. Jim Rugg and Jasen Lex, two fine artists in their own right, host a great podcast that I’ve been listening to recently. More often than not the discussions shed light on the artistic growth of the interviewed artists. Given the breadth and quality of many of the interviewed artist’s work, it’s a hell of a satisfying listen. The inspiring thing about this podcast is that it’s ripe with ideas and tips from folks who are eking out artistic lives, making the rules along the way. So far, Rugg and Lex have chatted with Wayne Wise, Cecil Castelluci, Farel Dalrymple, and Tom Scioli. Have a listen while you ink. I pride myself on not being too highfalutin. 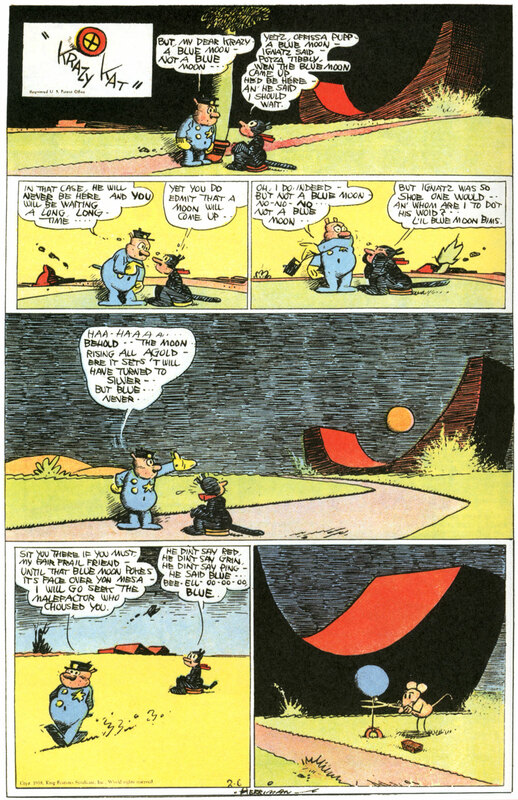 As such, I won’t try to talk about the role that George Herriman’s Krazy Kat plays in the 20th centuries art traditions. Nevertheless it’s important to note that with fans like Pablo Picasso, William Randolph Hearst and e.e. cummings lovers of Krazy Kat are in good company. Krazy has been floating around me for the past two years but only recently have I given Herriman’s work the time of day. I regret every second of those two years without Krazy. From the simple premise: Kat loves Mouse, Mouse Loves Self, Dog Loves Kat grow an infinite set of stories that Herriman masterfully captured in pen and ink. Reading Krazy requires some patience on behalf of a reader. Each page has its own visual meter and Herriman’s writing jumps across language and orthography often. Nevertheless, those who stick around begin to notice how it is exactly that he plays with the meter. With enough patience and faith in Herriman, a reader can experience sublime visual rhythms of his 90 year old strip. His lyrical prose is absolutely marvelous. To read his comics you wind up channelling something from outside yourself and that is their beauty. While reading Krazy Kat: The Art of George Herriman, I came across the following well known quote. Herriman’s own description of his creation brought me to tears. Herriman was a gentle man who deserves to be remembered. You can begin remembering him by paying his legacy it’s due. Read some of his Sunday pages. Take your time and savor every moment.